This is so sweet Bev. The image is adorable. What a lovely anniversary card, perfect for our non birthday challenge. Thanks for joining us at Stamping Sensations this month. Such a sweet image. Love your card!! Super cute image! FABulous colours too. LOve it. I'm waiting for hubby to finish watching football lol..Broadchurch is being taped! This is just darling - like the white space and design. Thanks for joining us at Great Impressions Stamps! Gorgeous card, love the design and not forgetting the cute image. So very sweet, a totally adorable image :) Thanks so much for sharing with us at Eclectic Ellapu! A fabulous card! Thanks for joining in our special occasions theme at stamping sensations this month and good luck! 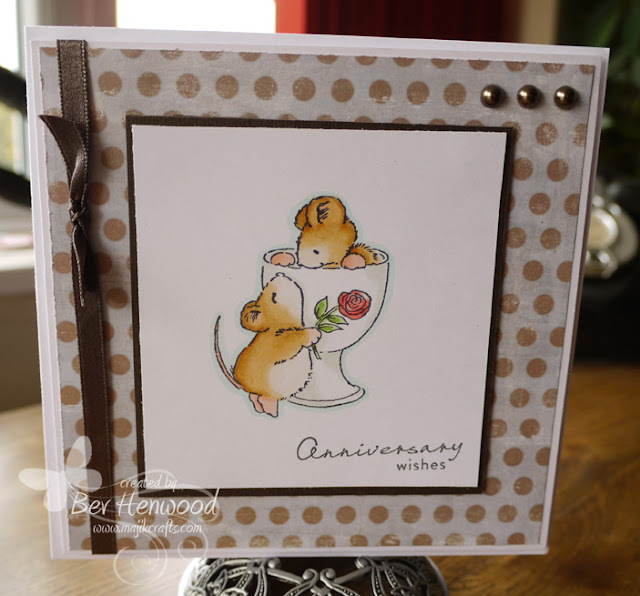 Gorgeous card Bev, I love the sweet image and beautiful colouring. Thanks for your kind comment on my pink and beige card. To make my flower I used felt and layered it up a few times, hope that helps. A beautiful celebration of love! Thank you for joining us at Eclectic Ellapu for our 'Anniversary, Engagement or Wedding' challenge!